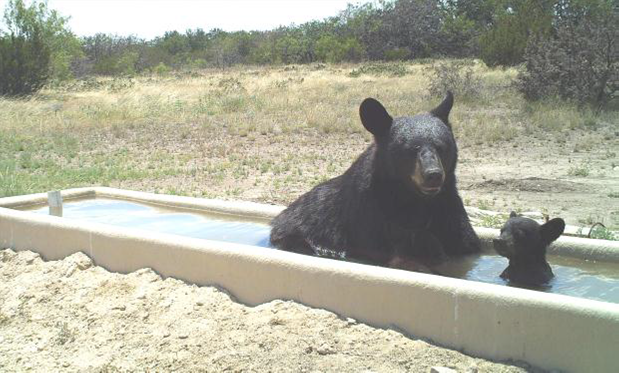 Black Bear Mother and cub enjoying a cool dip in a Hill Country water trough. By the 1960s, the Mexican black bear disappeared from its historic range in Texas because of shooting, trapping and habitat loss. Over the past few years, though, we’ve seen its gradual return from across the border in Mexico. 16—You know, Mexico sustained some huge wildfires during the drought, and it destroyed a lot of habitat for bears, and sent a lot of the young ones and a lot of the – any of the hungry ones – on long walkabouts looking for food. And a certain number of those ended up in Texas. 33—Whether or not they’re here to stay depends on how good an area they’re able to find for food. So, if they find suitable habitat, they find good food resources, if they find a female – or if there is a female here for reproduction – then we could end up with potentially a couple of little pocket populations of bears in some remote ranches and stuff out in the Western Hill Country. And, you know, I suspect we have a few stragglers out in the Hill Country right now. Although, we haven’t had nearly the number of sightings in the last year that we had previously. Do we need to be concerned for our safety with the return of black bears to Texas? We answer that question tomorrow. The Wildlife and Sport Fish Restoration Program supports our series and funds diverse conservation projects in Texas. For Texas Parks and Wildlife, I’m Cecilia Nasti. I do not think that we should be concerned for our safety because of the return of the black bear to Texas. Yes, I know that they can be dangerous, but so can a lot of animals, even our pet dogs and such can be considered dangerous, yet people still own them and do not worry about them being harmed by their pets. I know some people will say, yes, but bears are wild animals and dogs are domesticated and would never harm a person. I think that if some research was done, you’d find that more people are killed or attacked by “domesticated” dogs, more than they have been by any wild animal. As long as people are alert while out in places where any wild animal like a bear could be, then they should be fine. I also know people worry about mountain lions. I have a friend that worked at a park and they found mountain lion tracks one year. They said that they were not going to let anyone know about the tracks, because then the media and others would try and get word out that there was one in the area and it would send a panic through the people. It might have even turned out dangerous for the mountain lion, because someone might have gone looking for it to kill it. I remember this happened some years back in the Corpus Christi area if I remember right. A mountain lion was spotted in a neighborhood and there was someone that said they were going to go look for it and kill it, before it could hurt anyone. I am a little concerned about seeing this information in the last two blog posts, because of people like that. I just hope people understand that animals returning to Texas and anywhere else that they used to be is a good thing and it is nothing to be too worried about, especially when it comes to wondering if it will put you in danger. Thanks for writing and you are absolutely correct that relative risk of an attack by a black bear on a human is extremely low. However, because Texans aren’t used to living with bears, we think it is better to address this issue head-on with good information than to leave people wondering. While bears can be dangerous, the risk is quite low. Between 1900 and 2009, there were 14 fatal attacks on humans by black bears in the lower 48 states. This is very low when compared to the 18-20 deaths per year from domestic dogs, 40 deaths a year from bee stings, or 86 deaths per year from lightning. However, even though the risk is low, it is real and should be taken seriously. To reduce this risk the best thing we can do is make sure bears don’t become conditioned to eating human food. Carrying bear spray and never approaching a wild bear are also good precautions. These are amazing animals and hopefully with the right information, Texans will be able avoid conflicts and once again enjoy getting to see them in the wild. So excited to see all this new research and the return of the Black Bear all over North America!!!! I grew up in love with the docile black bear. We were always told if you are in the woods and it smells like garbage, its most likely a bear and to just make sure you do not get between the cub and the mother. Black bears are so different then other bears. Fear of bears is mostly because of those larger species. Here in Texas there are lots of other animals that are much more likely to hurt you snakes etc. Where I grew up we have lots of woods and had lots of bears. They loved the blueberries and other fruit patches. I wanted to know where a volunteer might be able to take part in any bear research. Have there been any tagging projects or den locations ?